Socialist? No problem, but a President who’s only a year younger than i am? The horror, the horror. A few days ago i jumped on the Segway and rode around to the block of Jess Street that borders the southern side of my apartment complex. I stopped at a house near the east end of the block and rang the doorbell. A woman answered the door, and i introduced myself as her new neighbor who in September had moved into the apartment complex behind her back yard and who passed her house daily on his trips downtown. I’d spotted the heavily laden Meyer Lemon tree in her front yard, had noticed a good many fallen fruit, and had a proposal to make. If she would give me five pounds of the lemons, i would make a marmalade of them. I’d get about ten jars and would give her three in the spirit of nineteenth century barter. Oh dear. So i heaved a sigh, rose to the occasion, and told her the main points of that in Spanish. Oh yes, i made some mistakes. I stuck in the French word for “behind” instead of Spanish, but since i was pointing and there was no other apartment complex in the neighborhood, she understood. I didn’t know the word for “jar”, so i had to say “closed glasses” and mime screwing a lid on. And i’m sure i got the gender of some of the nouns wrong, but she was smiling and nodding and clearly understanding. Then she broke the bad news. It was not a Meyer lemon tree but rather an orange tree. Crushed, i told her that a marmalade was not possible because oranges were too sweet, and she responded that hers were sweet and offered me some just to eat. I said, OK, i’d take a couple, and she said to take a lot. I thanked her, saying she was very nice but that two would be enough. Which i took. And then a few days later swung by and gave her a jar of my Rangpur Lime Marmalade. So what’s the big deal about that anecdote, you ask? Well, a while back i’d whined about my mind slowing down so badly that i could not learn new Spanish vocabulary and conjugations for the past tenses, so i’d missed the last two classes and was working up my nerve to formally drop out. This encounter made me realize that when push came to shove i could get along in Spanish and that dammit all i just needed to redouble my efforts to learn more. And then i sat down and pounded on the past tense conjugations until i was able to repeat them all. Kept singing them all several times during the morning, and whaddya know, i was able to repeat them the following day and stick them on several verbs. For example, the preterite, without looking at the book: é, aste, ó, amos, aron, í, iste, ío, imos, ieron. etc. etc. Next i’ll start pounding in the rules about when to use which tense. Also, i went ahead and learned the word for “jar”. I had great fun learning my beetje of Dutch, but Spanish actually comes in handy in California, and besides Sr. y Sra. Yerena, my longtime vendors in the city, are just delighted that i’m now speaking mangled Spanish with them. Gotta improve it because when i met the Sra in 1996 she could barely speak a word of English, and now she’s just plain fluent. Can’t let an immigrant farm wife outdo me. Legal immigrant. 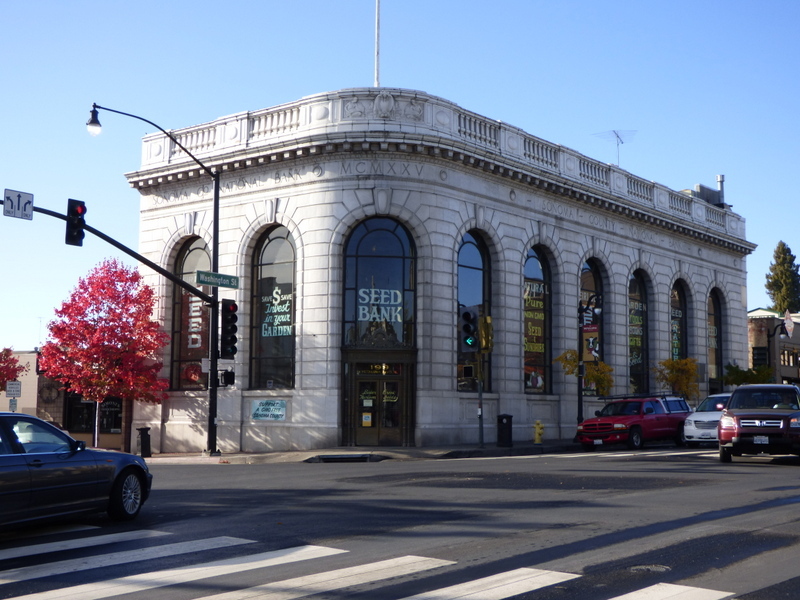 Meanwhile, the Seed Bank, a 1925 bank now repurposed as Baker Creek Heirloom Seed Company’s west coast location. An astonishing selection of seeds (you want 25 varieties of okra? ), books, and a selection of high end gardening tools and gardening supplies under a thirty foot hammered metal ceiling. A clean, naturally lighted place at the corner of Petaluma Boulevard and Washington Street.